Costa Rica was a “submarine release” (to borrow a term from fellow OG writer Jonathan Franklin) – I literally knew nothing about it until it surfaced on my front porch. Though I think I’m pretty close with the Lookout guys – I had no advance warning of this at all. Once I did learn about it, I was instantly interested as it brings together two designers with recent hits for me (Relic Runners for Dunstan, Divinare for Gilbert) from a publishing house that has almost always produced hits for me (Lookout). In Costa Rica, players explore the country trying to count the different animals found there. The map is made up of hexes in a larger hexagon (5 hexes to a side). There are three different types of terrain: Forest, Mountains and wetlands. Each terrain type also has a common and a rare animal type for that terrain. For future reference, you should know that there is a different chance of finding animals based on terrain as well as different chances of encountering danger (represented by a mosquito). 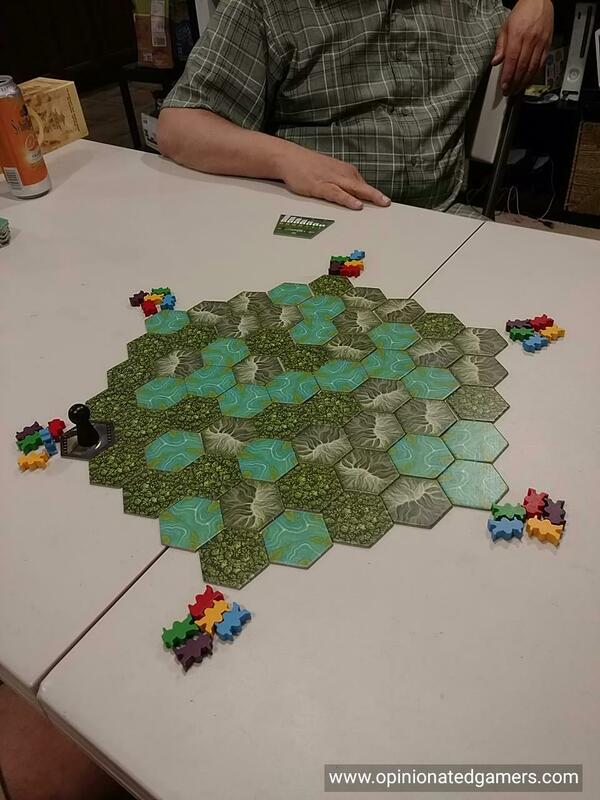 Each player takes six explorers in their color and places one at each of the corners of the board. One of the players is designated the start player, and he gets the exploration leader token. For each round, the expedition leader chooses any expedition (group of meeples) on the board, as long as it contains one of his own meeples in it. The entire group moves to an adjacent small hex from where they are. That tile is revealed (it may show one animal, two animals or possibly a mosquito representing danger! ), and now the expedition leader can choose if he wants to keep that tile or pass. If he chooses to keep it, he takes the tile and his explorer from that group and places them in front of him. The rest of the group is then placed on the space where the tile was taken, and the expedition ends. If the expedition leader passes, players in clockwise order get the chance to take the tile. If they do, they remove the tile and their explorer from the table and the expedition ends. If all players pass, the expedition leader now chooses another tile adjacent to his current position, and then decides to keep ALL the currently revealed tiles or pass. A threat tile may be revealed as well – and no one can choose to take it. If a second threat tile is revealed in a round, the round automatically ends, though the current expedition leader is able to keep all revealed non-threat tiles that had already been revealed. Remember, if any player claims tiles, the round is over. The expedition leader passes the start player token to the next player clockwise who then gets to do it again. Also, if an expedition ends its turn without having any tiles adjacent to it, it simply can not explore any further. Any remaining explorers are removed from the board. The game continues on until all the explorers have been removed from the board (this also happens when the final tile is removed from the table). The game then moves into the scoring phase. Each of the six animal types is scored separately – you score 1/3/6/10/15/21 points for having 1/2/3/4/5/6 tiles of that type. 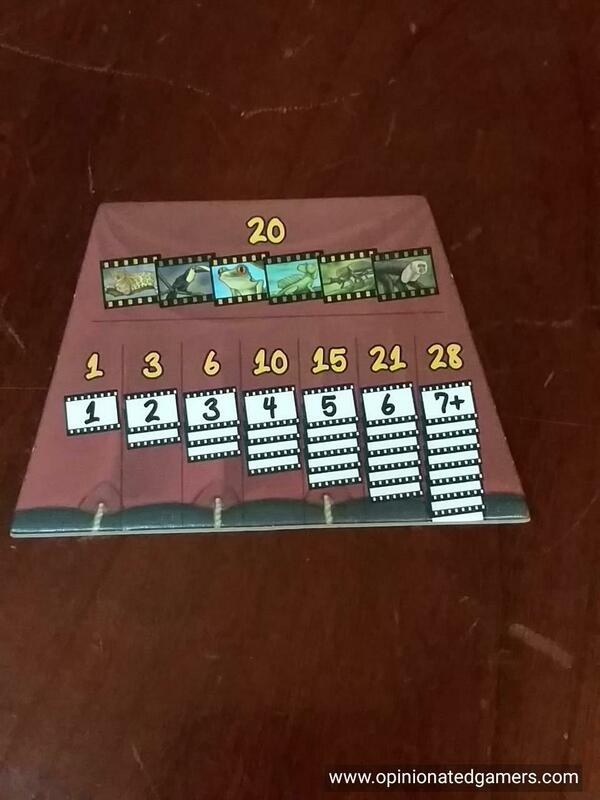 Furthermore, you get a 20 point bonus for each complete set of six different animals that you have collected. The player with the most points is the winner. Ties go to the player with the most animals of any type. 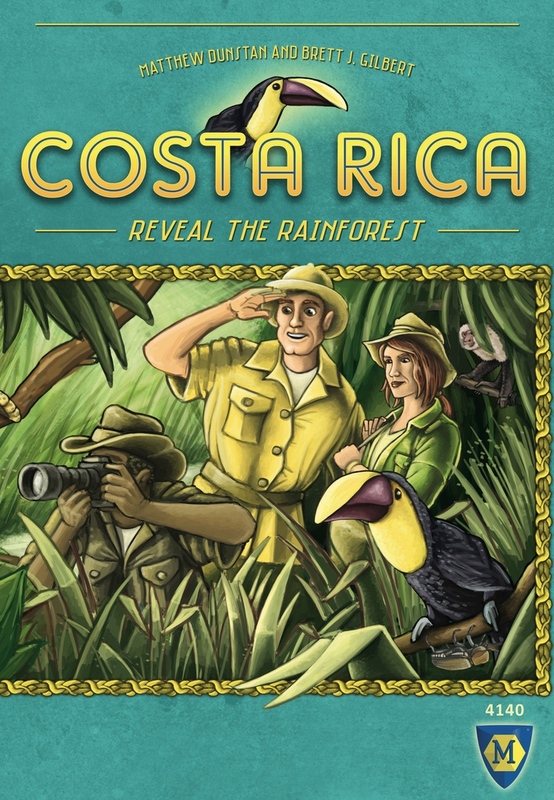 Costa Rica is a well-designed middle-weight game – the design team of Gilbert and Dunstan have come up with another game that hits a lot of my sweet spots. The push your luck aspect of exploring is exciting, and you generally have a few different options to choose at the start of your turn. Knowing which animals are found on the different types of tiles allows you to maneuver the group towards the animals that you want. The scoring system rewards you for both variety and depth, but as you only have 6 explorers to gather tiles, you really don’t have enough opportunities to do both. My own strategy is to try to get a full set of 6 different tiles as the 20 point bonus can be a significant part of your final score. That being said, I just lost last weekend to a player who maxed out the two most common animals and squeaked out the win. Though it hasn’t happened to me, I have seen a few gamers have some negative experiences with the game. It is possible to end the game collecting very few tiles, especially if you are unlucky with multiple threat tiles when you are the lead explorer combined with other players cutting off your other pieces. The game is generally short enough that this pseudo-elimination doesn’t bother me – but it also is a reason why I wouldn’t consider this for a gateway game or something to pull out with just any group. However, it is a really good fit for a lighter game amongst regular gamers (i.e. my regular group). Doug G.: Solid “Hey That’s My Fish” meets “Incan Gold”/”Diamant” family game. Ted A.: This was a surprise hit for me. The decision to stop and take tiles has several dimensions that aren’t apparent until you’ve completed your first game (and even then, there’s still more to discover). 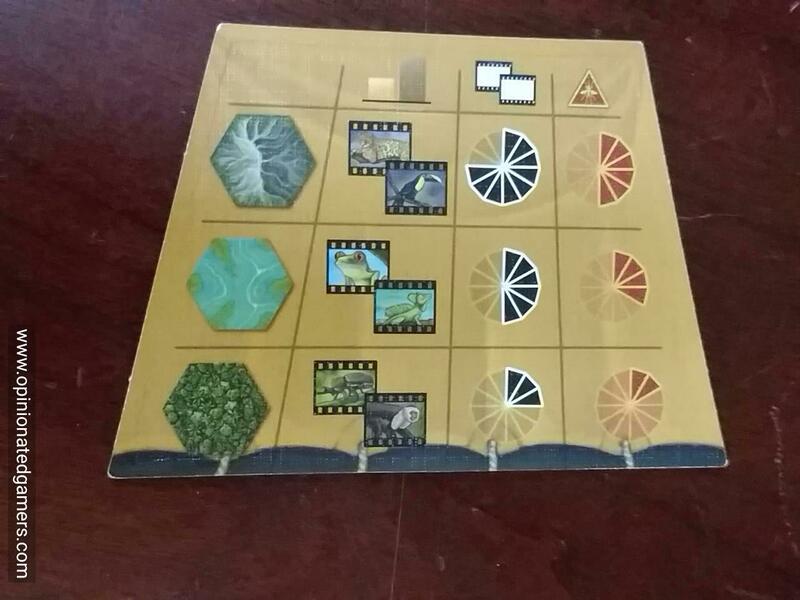 The obvious “do these tiles move me significantly to my goals” question is ever present, and it often overshadows the other areas you need to focus on: First, is it likely I’ll get a better set of tiles when another player moves their explorer? Second, will I have a chance to direct my explorer to a better set of tiles and manage to secure them? Third, am I putting that explorer at risk of being stranded with no tiles (in which case your explorer, and others on that spot, are removed from the game with you getting nothing at all)? Fourth, can I maneuver my explorer into a spot where I can strand my opponents with few or no tiles? And finally, How much to do the current set of tiles help the other players (not just the ones after me in turn order, but the ones before me, because they’ll pick before me during the next move)? Great stuff in a small package with really short playtime. I love it! Ted A.
I like it. Dale Y, Lorna, Doug G.
Pleasant game that has a very heavy dose of luck. As Dale mentions, it is quite possible for players to get virtually shut-out, especially when playing with 5 or 6 players. While pleasant, I don’t think the game will have much staying power. How similar is it to Cant Stop? This theme is very intriguing. Costa RIca is not similar to Can’t stop other than the push your luck aspect. There isn’t any dice rolling, and in Can’t Stop, you never have to worry about other people stealing the tiles out from underneath you. I think there is a lot more decision making to be had in Costa Rica than Can’t Stop. In addition to the games Dale cites above, Dunstan and Gilbert jointly created the well regarded Elysium last year.